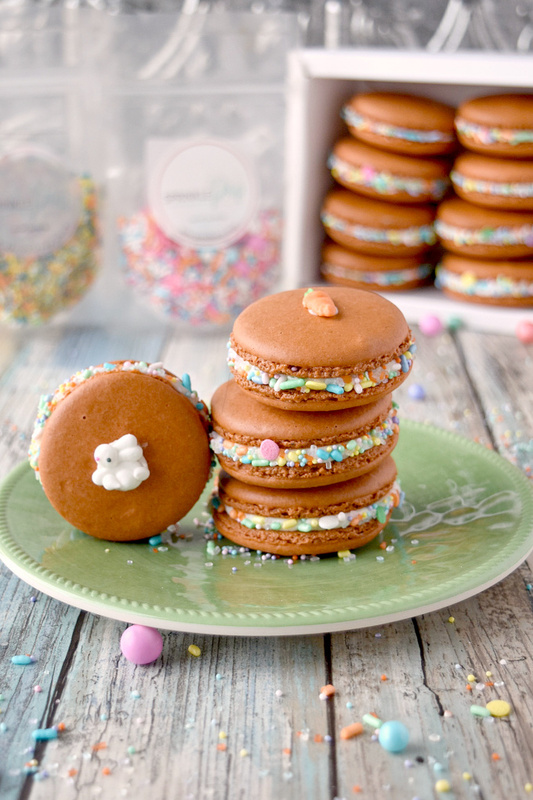 With carrot juice powder and spices in the shells, these Carrot Cake Macaron taste just like a carrot cake! The cream cheese buttercream filling helps bring the flavors home. The sprinkles are just because they’re fun! Of course. Y’all knew I had to make some macaron for this event. I think it’s a goal to make macaron for all the events. ALL the events! Even the ones about savory recipes. Stay tuned for that. This event right here is about spring sweets! You knew I had to make a carrot cake macaron at some point. Didn’t you? It’s only a given because, well, carrot cake and rabbits are almost synonymous with that spring holiday most of us celebrate. And, well, I LOVE making macaron! I see you all there. Shaking your head thinking I’m a crazy person. Macaron are finicky, they’re impossible, they take too much time and effort. I say HODGE TO ALL OF THAT! And yes, we’ve had this conversation before. I will probably have this conversation with you again until you just try to make them. At least once. And then let me know how it goes. I’ve had almost EVERYTHING go wrong with them. I’m not kidding. From hollow shells to wrinkled tops to super crispy cookies. There’s nothing I can’t trouble shoot for you. In fact, I’m helping a member of this group with them. RIGHT NOW! Well, not at this same time. That would be confusing. But I am helping a member of their family trouble shoot their macaron attempts. And I can easily go through all my previous posts and explain what happened to those attempts, too. The success of making macarons boils down to one thing: MOISTURE! For those that gripe about my measuring the ingredients for macaron, tough. The key to creating consistent and perfect macaron is managing the moisture content in your ingredients. If you use cup measurements, you’re not going to get the same results in your kitchen as say someone in the mountains or near the beach. Weighing the dry ingredients takes the moisture content into consideration. This means that you’re more likely to be successful at making them. It also means your macaron will be more consist every time once you get them down. Why do you let them rest or dry before you bake them? Drying the macaron shells allows the tops to form a crust and dry on top while it keeps the inside macaronage still moist. This is what helps create those epic feet or pied of the cookie. The centers heat up and cook. But since the tops are dried, the only place for the steam to escape is to push the tops up. This allows the steam to escape out the sides thus creating those little feet. The last time I made them, I had to allow them to dry at least an hour before they were dried. I know. If they’re so finicky then why do I keep making them? Why would anyone want to make them? Because once you make them correctly you’ll be addicted to making them again. And then you’ll make them all the time like I do. I think they’re fun to make and they’re super rewarding. When you see those feet, taste those shells, and have someone say, “You made those?” That is what makes it all worth it. Besides, I get to decorate them with fun sprinkles like these! Sprinkle Pop has some of the prettiest sprinkles and decorations I’ve seen. Granted, I’m not a huge cake or cookie baker, but just look at how fun their sprinkles mixes are! What sets Sprinkle Pop apart, aside from only being a couple of years old, but they make custom mixes. Yes! They will make a custom mix just for you and your needs. Not sure what colors work together? Not to worry! Liz, the owner, has a great eye for complimentary colors and great texture combinations. See what I mean? Just look at all that bright color. All those shapes are just super fun to work with not only on cookies but also cakes, cupcakes, pancakes; you name it! This mixture had the little bunnies and carrot decorate shapes. It had large and small decorate balls and all this confetti fun that’s hard to resist. Aren’t those bunnies and carrots just super cute? Those balls rolled ALL over the place. It was difficult getting them to stay in place. A few of them rolled off the table onto the floor. And while I was cleaning up my surface, more rolled onto the floor. This included some of those tiny little balls. It was fun trying to herd them all into the bag. I wound up having to vacuum the floor when I was finish so the dogs didn’t try to eat them. Don’t these put a smile on your face? Don’t they make you happy? I know they make me happy. They came out exactly the way I hoped. Well, minus the buttercream. I always fail at buttercream. The recipe I have given you are the adjustments I made to the recipe after the fact. However, the flavors of all the elements are spot on. The carrot powder in the shells adds that little veg flavor you’d expect. The spice mix also in the shell brings that carrot cake flavor you’re expecting. This is a combination of a delicious German gingerbread spice mix with a little added cinnamon. Finally, the cream cheese buttermilk adds that little tartness that brings it all home. Next to the red velvet macaron, these are my next favorite. 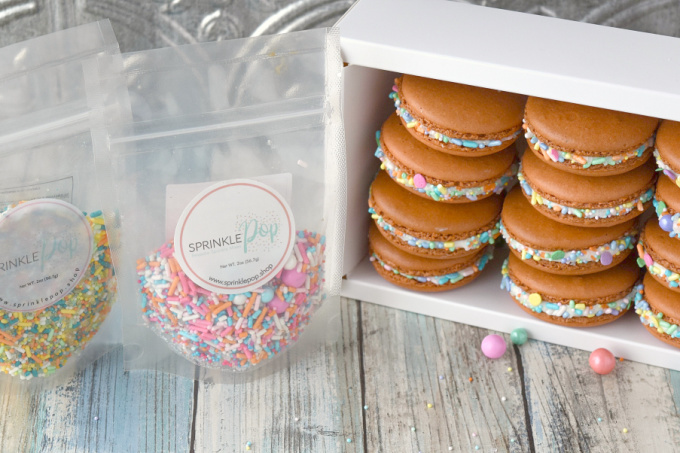 Sprinkle Pop supplied us with some sprinkles for this event. I chose three smaller packs. They’re more my style than a larger bottle. I don’t bake THAT much. That’s literally a whole other post that I won’t get into right now. I did get a large bottle for another event and had a BLAST with that bottle making the gingerbread macaron. See how fun their sprinkles are? I can’t wait to bust into the other two packages in the background there and cook up more macaron, or cupcakes, or whatever else inspires me. Sprinkle Pop colors, mixes, and shapes are just inspiring! I hope you get some inspiration by visiting their site and following them on Facebook, Instagram, and Pinterest. Make sure you enter the rafflecopter below. You can check out my PB&J PEEPSomars for all the prize packages. While you’re at it, scroll on down and see what the rest of the bloggers are sharing today. We’re not even halfway through this event and I’ve already saved SEVERAL recipes to make after this craziness is done. 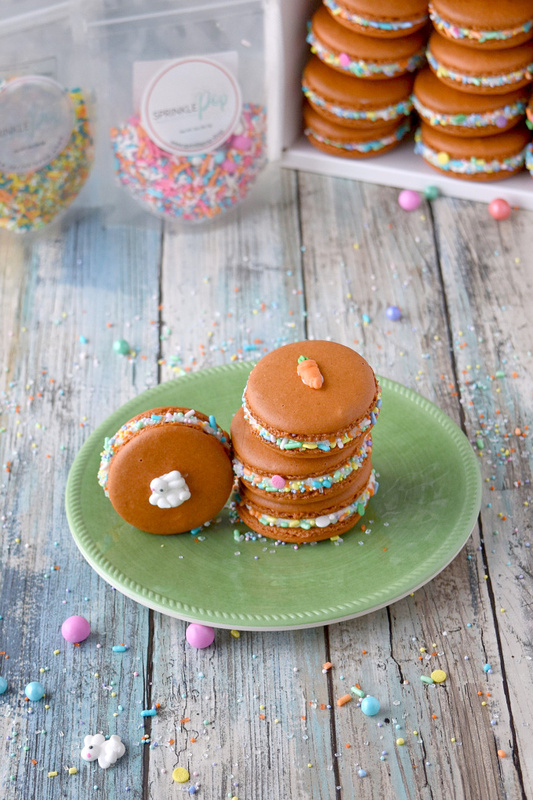 With carrot juice powder and spices in the shells, these Carrot Cake Macaron taste just like a carrot cake! The cream cheese buttercream filling helps bring the flavors home. The sprinkles are just because they're fun! Pulse the 7 ounces powdered sugar and 4 ounces almond flour together with the 2 ounces carrot juice powder in a food processor to form a fine powder. Sift three times into a large mixing bowl. Set aside. Place the egg whites in the bowl of a stand mixer (or large, metal mixing bowl). Sprinkle the cream of tartar over the eggs and hand mix the two together with the whisk attachment for the stand mixer (or hand mixer). Fasten the whisk attachment and beat the mixture on medium speed until foamy. Slowly add the granulated sugar and continue to beat on medium speed until soft peaks form. Increase the speed to high and beat until stiff peaks form. If you're using some food dye, add it at this point. I used just a little red and a little yellow. Add this along with 1/3 of the almond mixture into the meringue. Continue folding and adding the almond mixture until all of it is incorporated into the meringue and the mixture should drip slowly off the spatula; like lava flowing. (Think conditioner dripping out of a bottle. That works for me.) The mixture will have a sheen to it when it’s ready to pipe. 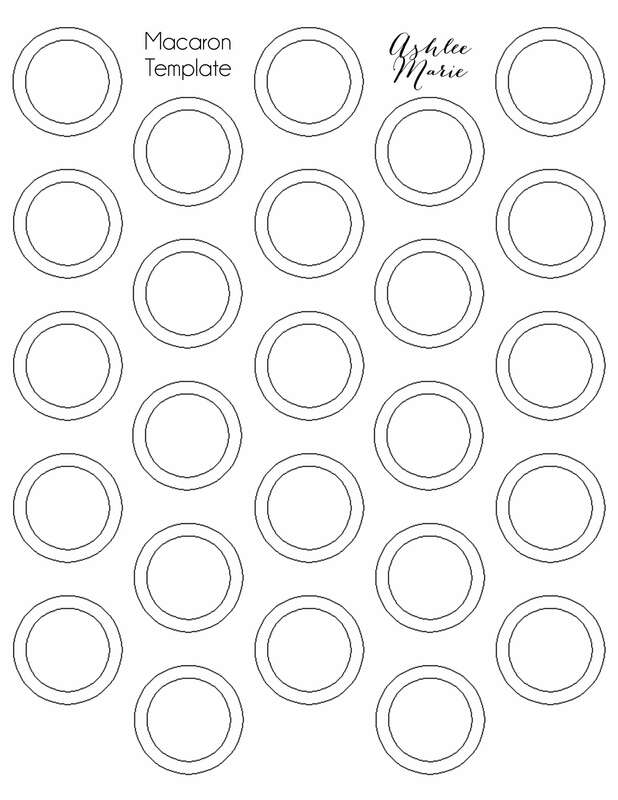 Transfer the batter to large piping bags fitted with a 1/2 inch tip and pipe 1 1/3 inch rounds onto a silpat covered baking sheet. There are several different templates out there. Two that I like are here and here. You’re going to LOVE this next part! Once all the batter has been piped or your sheets are full, grab the edges of the pan, secure the silpat with your thumbs (or any extra batter) and rap the pans on the counter. That’s right! You heard me! Bang them on the counter!! This releases any remaining air bubbles in the meringue. Continue rapping the sheets, turning occasionally, until no more air bubbles surface. Allow the macaron to rest on the counter at least 30 minutes or more depending on the humidity level of your kitchen. Once they’ve rested and the tops are no longer sticky to the touch, bake at 325 for 7 to 9 minutes. Rotate the pans front to back and top to bottom and bake an additional 7 to 9 minutes. Do the wiggle test to see if the meringue is cooked; carefully grab the top of the shell and see if it moves easily from side to side when wiggled. This indicates that the meringue isn’t completely cooked. Continue to cook in 2 to 3 minutes intervals until they wiggle just slightly. They will continue to cook as they cool. Remove from heat and allow to cool completely before filling. Place the cream cheese and butter in the bowl of a stand mixer (or large mixing bowl). Beat until creamed together. Slowly add the powdered sugar one cup at a time until thicker than desired. Add 1 to 2 tablespoons of the heavy whipping cream until the desired consistency is reached. Pipe buttercream on one shell and top with a shell of matching size. 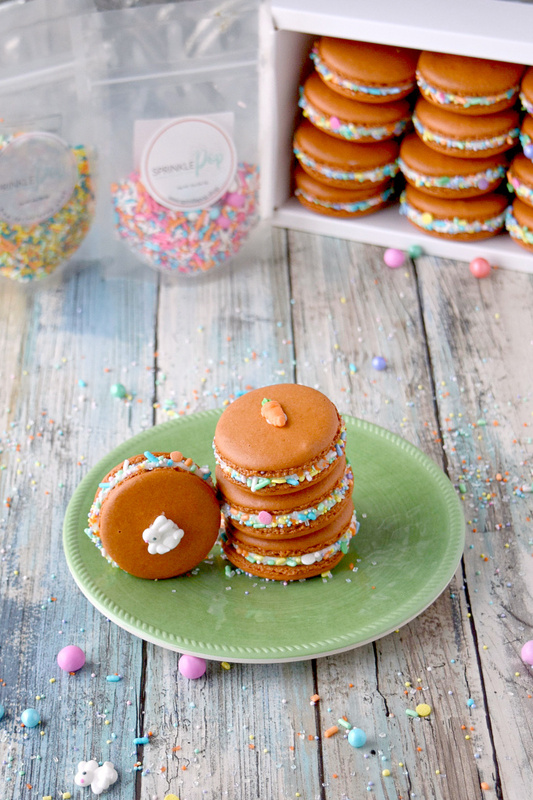 Pour sprinkles in a bowl and roll the macaron in the sprinkles to decorate. Offer accepted! When my kids are away this summer, I’m going to give macarons another attempt. I’ll be poking you for help if I fail again. YAY! I’m always willing to help out with macaron. These are beautiful! And the bunny and carrot sprinkles on top are the perfect touch! Thank you! Those sprinkles are just too fun. 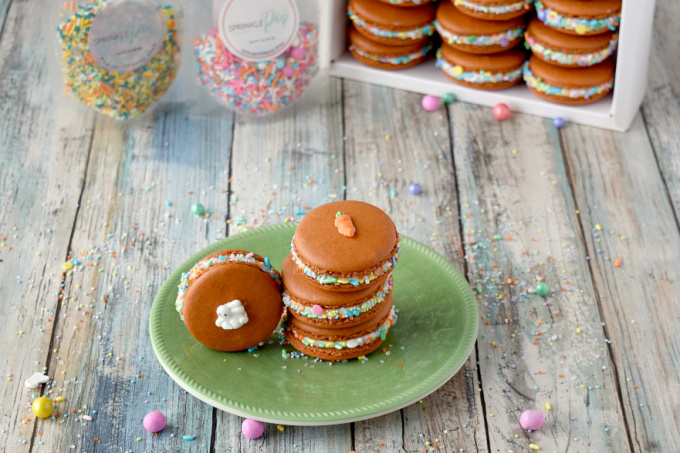 I love love love macarons and these carrot cake macarons look amazing! Thank you! I love love love them, too! They’re so fun to make. 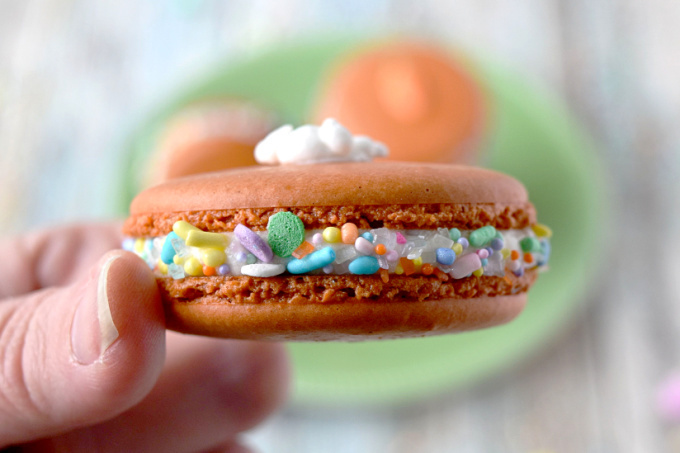 I love everything about these macarons…those sprinkles are the bomb too! Macaron Queen strikes again! The colors and texture you got on these is amazing! Carrot cake flavor sounds perfect for spring! Thank you! They really do taste like carrot cake for spring/Easter. Challenge accepted!! Of course, it might be a little more difficult making them vegan, though. Maybe I’ll just have to try my hands at that for a change. You always make the most beautiful macarons. I love this flavor combination and the sprinkles are darling. Thank you! Those sprinkles are always so fun to work with. 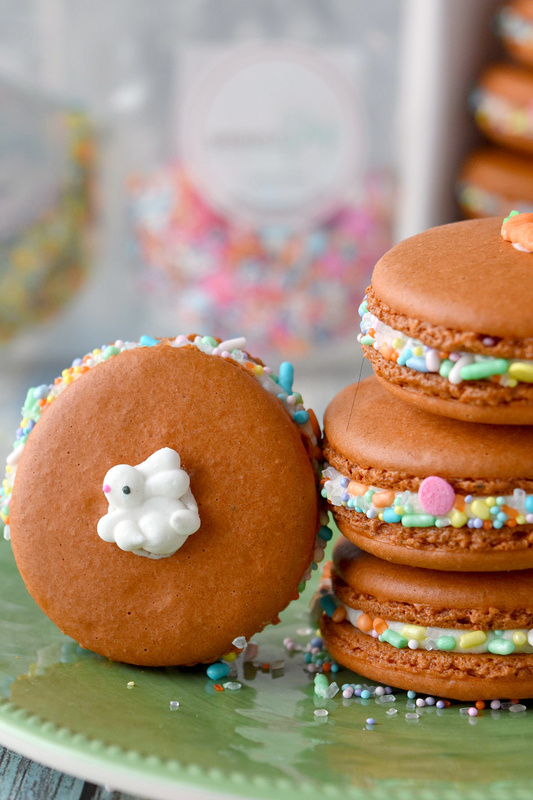 Carrot cake macaron would be a winner in my household. My daughter loves them. 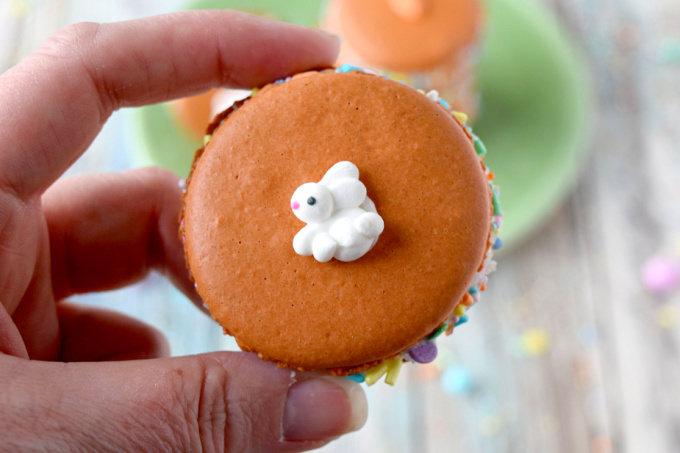 You are so creative using carrot juice powder and those sprinkles are too cute! Thank you! The sprinkles are super fun, aren’t they? 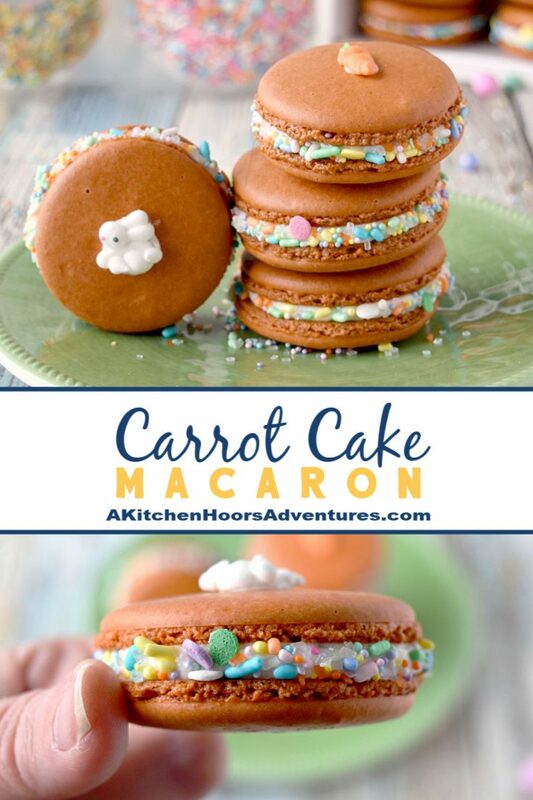 I love carrot cake and I’ve always wanted to try making macarons! So I’m definitely going to try making these some time soon! Please let me know how they turn out! I am pretty good at trouble shooting if they don’t turn out. those look so amazing! Perfect for spring and so decadent too! Wow, color me impressed. Such perfect macarons and I love the flavor profile. You could easily sell these in the finest bakery in France.